Saffron Tree is celebrating its third birthday on Friday, Oct 23rd. It is humbling to think that the blog, a tiny seed - much like the one in the story by Eric Carle - that I planted back in 2006, has made it so far. The one single ingredient that has helped this seed grow strong is the love and passion of our dedicated reviewers and readers for children's literature. As you know, we at Saffron Tree are very passionate about reading diverse stories from all diverse cultures of the world. 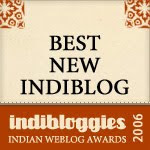 Today, we are a group of eleven blogger reviewers making up the contributing team on Saffron Tree, each with a voice so unique, and taste for books so eclectic. Just as saffron is handpicked, we have enjoyed handpicking our books for you the last three years. And to know we have made it to three whole years certainly calls for a celebration, isn’t it? To commemorate the event, the team at Saffron Tree is thrilled to be hosting our very first annual book festival called CROCUS! CROCUS is short for “Celebration of Reading Other Culturally Unique Stories”. Just as the saffron flowers, (a species of crocus belonging to Iridaceae), bloom with the fall rains all over Mediterranean and Southern Europe, from now on, Saffron Tree's very own book festival, CROCUS, will bloom every autumn to celebrate the love of books and cultures. Thanks to the brainwave of our fellow-contributor, Meera, it wasn’t difficult coming up with the name, CROCUS. And from then on, quickly everything fell in place with regard to the planning of the festival. Tharini, our one-stop source for all things creative and positive, got the flier ready in no time. This year, CROCUS 2009, will be celebrated for one week starting Friday, October 23rd – 30th. "Around the World in Seven Days" is the theme we have picked for the book festival . Visit us as often as you wish for a whole week of reviews galore featuring children’s books from and about varied cultures of the world! Take part in an exciting "in-house" crossword puzzle called CROCUSSWORD on the first day of the festival and win a book give-away as a prize. Don't miss our author interviews. 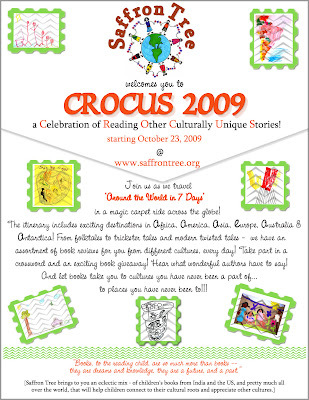 Please find below a flier giving you all the above details about CROCUS 2009. Feel free to send them to your friends and family. We are positive you don’t need a passport to explore the continents we will stopping by each day. Actually, you don’t even need a plane ticket! Needless to say, there is no reason to buckle up. Just sit back, relax and let’s all get ready for CROCUS 2009! Please click on the image to view it large. Thanks! oooo...so exciting to see th flier and the announcement up! Now we're setting the ball in public motion. Will send this flier to everyone I knwo! Creativity unleashed I must say. I tell stories to children and I like yr in-depth look at books. will be looking forward to it :).. I am excited. Looking forward to the posts. will also post the badge in my space and spread the word thro Twitter. Congratulations and best wishes for many more birthdays! Congratulations! Looking forward to more from you guys! Being the bookworm that I am, I started building a library for my children even before they arrived! I make it a point to read to my boys every night and nothing makes me happier than when I see them pick out a book on their own and attempt to 'read' it!! This blog is a FABULOUS resource! I have become a devoted fan!! Way to go, ST team! Once again -- Happy Birthday!